This week we hauled everything out of the nursery and my dad and I tackled the walls. I changed my plan a little here and decided to paint an accent wall rather than wallpaper it. 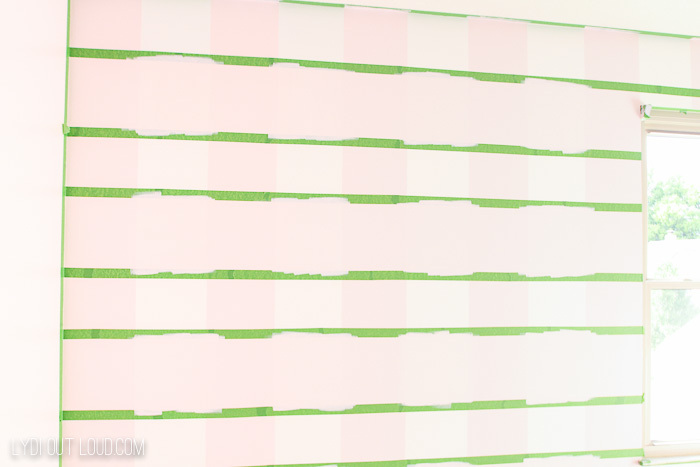 I had originally fallen in love with a pink Buffalo Check Wallpaper I found on etsy but the color wasn’t exactly what I wanted so I decided to paint it. I painted some buffalo check charger plates a couple of years ago and loved how they turned out, so even thought I was a little intimidated to try it on such a large scale I figured I’d give a try! 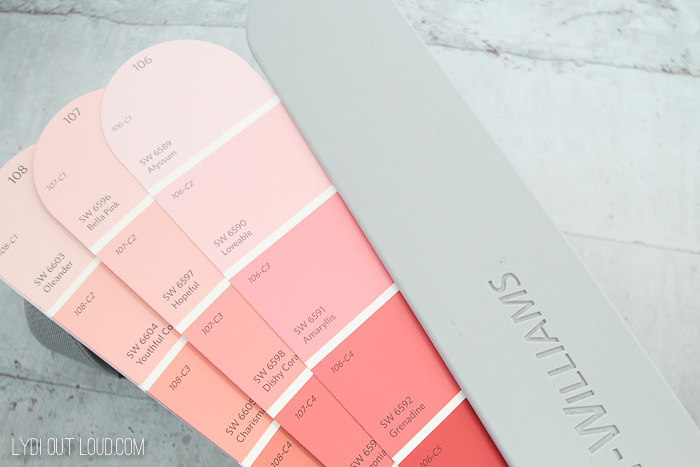 When selecting the colors for my buffalo check accent wall, I first determined the shade I was looking for (a pink blush tone) and then chose 2 colors (a lighter shade a slightly darker shade), along with white to create the buffalo check pattern. 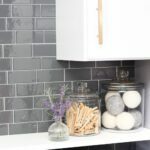 Depending on how much of a contrast you’d like for your buffalo check feature wall, you can either select 2 shades next to each other on the color deck (i.e. Alyssum and Loveable on the deck below), or if you want a little less contrast and not as dark of a color, you can take the lightest shade and lighten it. I wanted less of a contrast so I went for Alyssum as the darker color and lightened it by 50% for the lighter color which I also used to paint the other 3 walls. * The nursery is about 10′ x 14′ and there was plenty of paint leftover, so these quantities will work for a larger room as well. 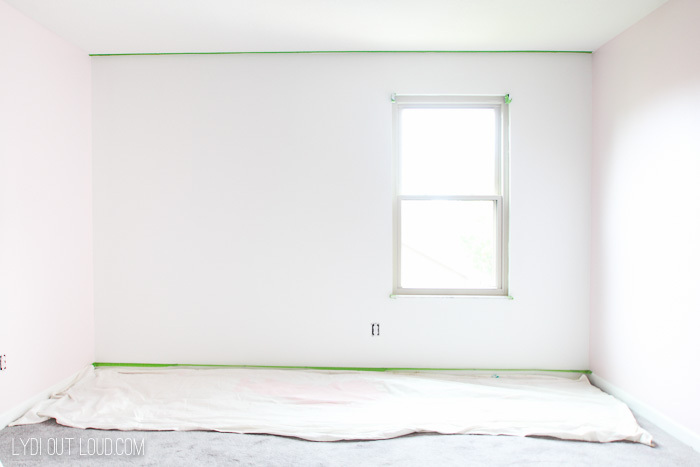 Step 1: Tape off the trim and ceiling and any windows and paint the entire wall with Pure White. Step 2: I went with 10″ squares for my Buffalo Check Accent Wall but you can increase or decrease the size to your liking. 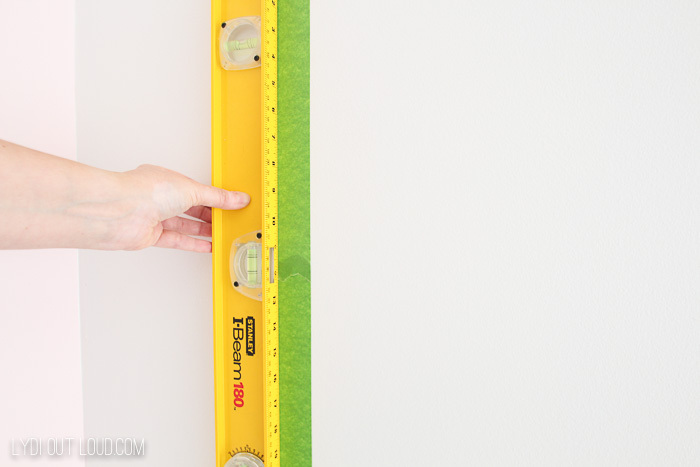 Begin marking off 10″ tick marks vertically up the entire height of the wall. 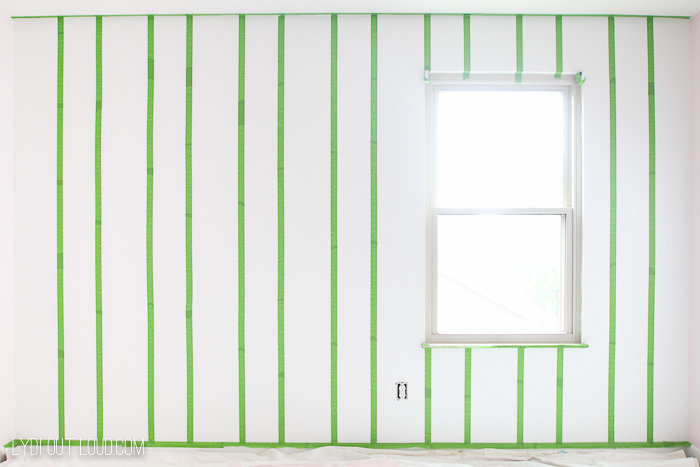 Connect the tick marks with Frog Tape, making sure you tape OUTSIDE of the tick marks for this step and ensure the tape is level. 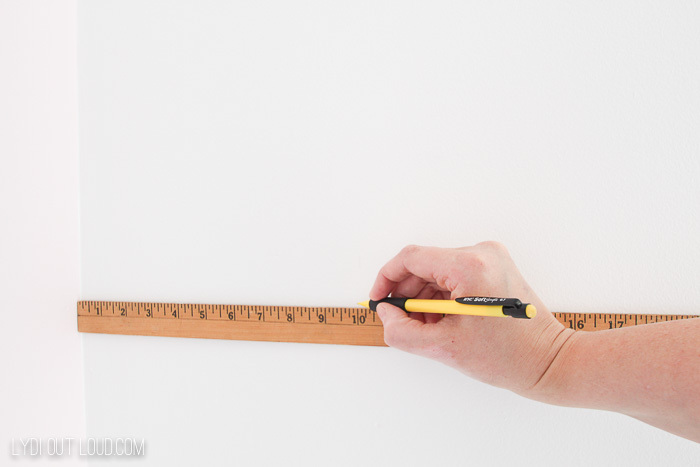 Step 3: For the next set of measurements, you will measure 10″ from the inside of the tape from the previous stripe and you will apply the next row of tape INSIDE of the next set of 10″ tick marks. 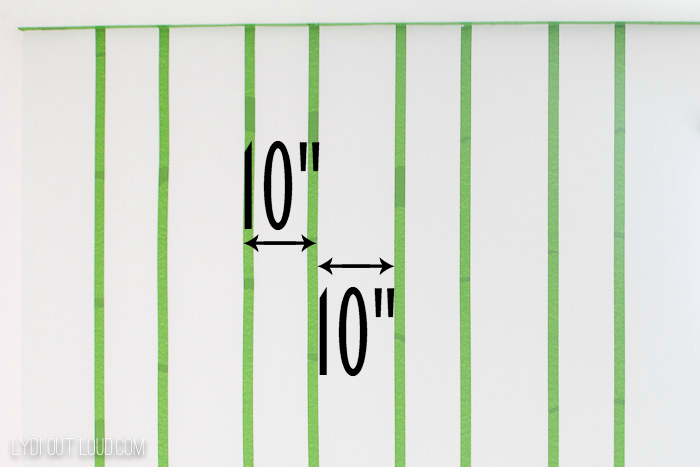 Every other row will be 10″ inside the tape lines and the other rows will be 10″ from outside the tape lines. IMPORTANT: Be sure to erase any visible pencil markings before you paint. 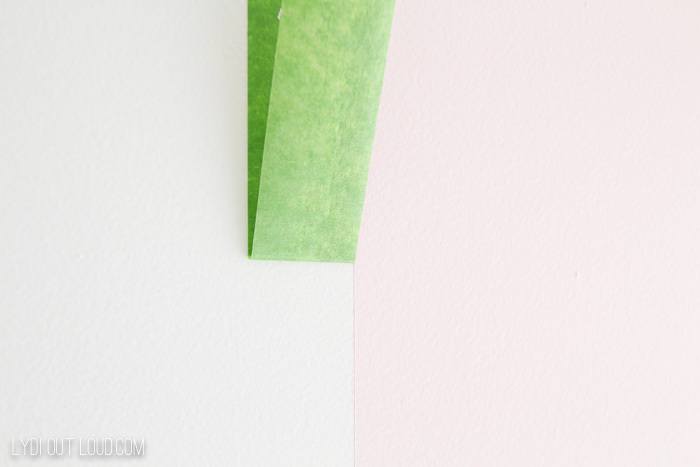 The markings that are hidden under the tape can be erased later. Using a roller, paint every other row with 2 coats of the lightest color #1 (the wide rows). Remove Frog Tape by pulling it back on itself. Allow to fully dry overnight. 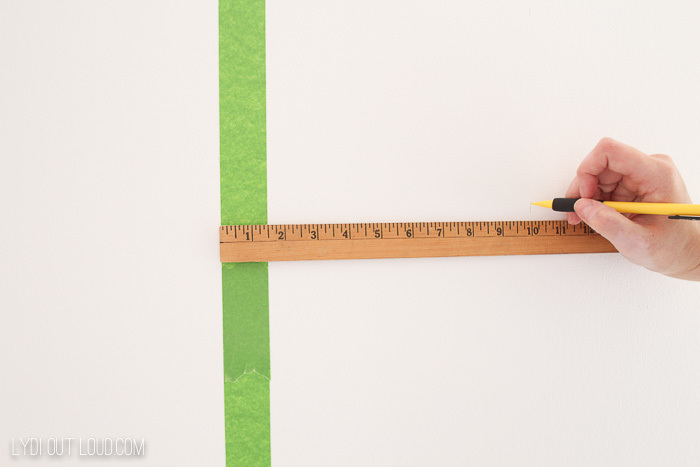 Step 4: Repeat the measuring and taping process to tape off the horizontal lines. Using a small foam roller, paint every other row (the wide rows) again with 2 coats of the lightest color #1. You don’t actually have to paint the squares that have already been painted because you will be painting over the overlapping squares with the darker color. Don’t remove tape once you complete this step. Allow to dry overnight. 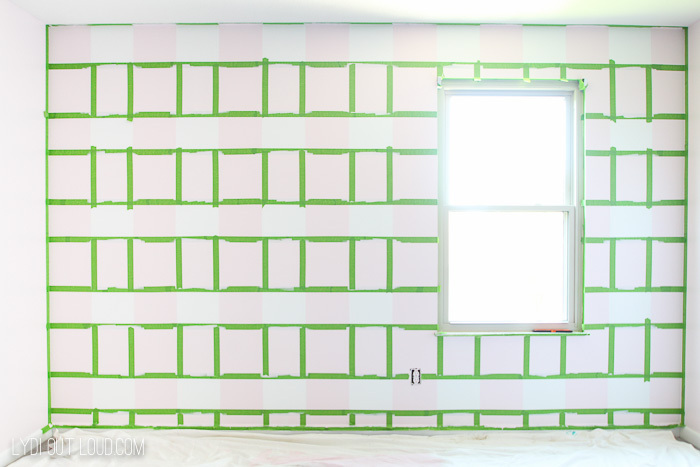 Step 5: Apply Frog Tape vertically to surround each square that has overlapping color. There should be a nice crisp paint line that you can tape along rather than having to measure again. Paint inside each large square with the 2 coats of the darker color #2. 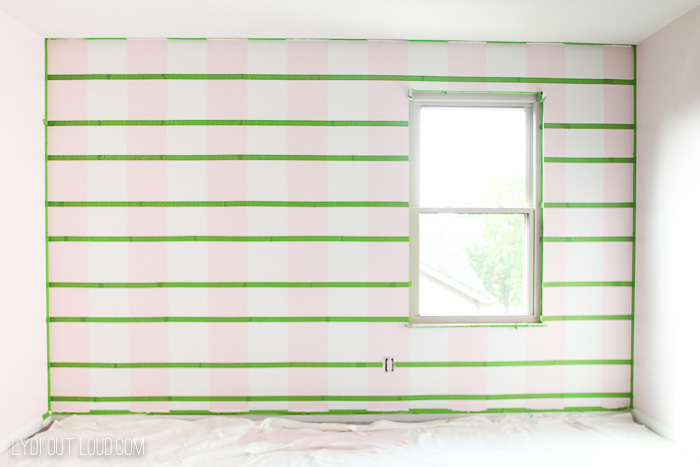 Remove all tape and reveal your beautiful new Buffalo Check Accent Wall! I can’t wait to see the impact this wall makes once the rest of the decor and furniture is in place! And you guys! 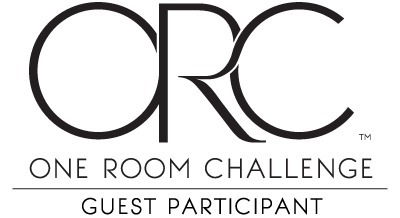 There are some AHHHHMAZING transformations underway on many other blogs that you can check out on the One Room Challenge site. Get ready to be inspired! Thanks so much for stopping by and I hope you’ll check back for all of the other fun projects we have in store for our little girl’s nursery! AMAZING WORK!! Sooooo talented. I want to do this in my basement. I was afraid I might mess something up but your instructions make it look much easier. Thank you! Awe this looks amazing Lydia!!!! 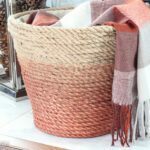 I want to try this technique for painting plaid on a big sign for Christmas to go over our mantle, thanks for sharing the steps!!! 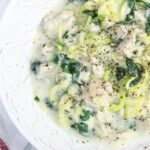 This looks amazing Lydi! I love the colors you chose. It’s going to be a beautiful baby girls room! Can’t wait to see the rest! Wow! Impressive! And great tutorial. This is so pretty. Never thought of doing this. Sparks ideas. Lydia, the buffalo check wall looks fabulous! You did a great job! I can’t wait to see the whole nursery! (and baby!). What a compliment! Thanks so much Melissa! WOW, I love it! 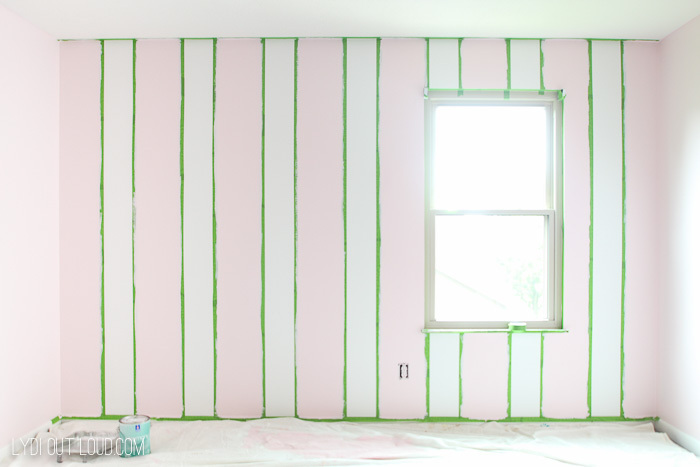 I have painted stripes before in my kids room, but have not ventured into trying buffalo check..it looks so good!! Thank you so much Denise, that’s so sweet! This turned out amazing! 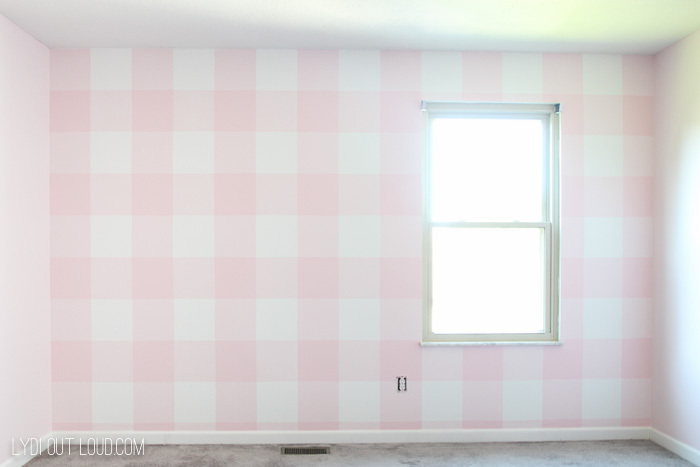 I love buffalo check and this pink wall is just perfect for a little girl’s room!